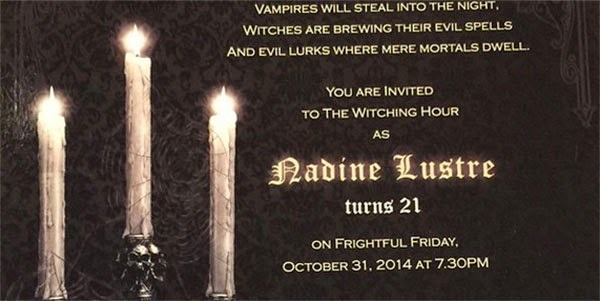 Kapamilya star Nadine Lustre is celebrating her birthday today, October 31, 2014. The actress has turned 21-years-old this Halloween. To celebrate both occasions, she merged her natal day and All Saints' Eve in a two-in-one birthday bash called "The Witching Hour." The invitation card, which was posted on Instagram by ABS-CBN AdProm head for publicity and social media Eric John Salut, says it all. The term "Happy Birthday Nadine Lustre" became a worldwide trending topic on Twitter this frightful Friday as fans and supporters greeted the actress.